Located on a rolling two-acre site, this rambler had been remodeled and enlarged five times in its forty-year life. The owners wished to resolve awkward floor plan, while adding two new bedrooms for their children, a new Master Suite, an office, a recreation room, and an updated kitchen. An existing Music Room and award-winning cabana were to be retained. To bridge these new elements with the original house, we extruded the original roof form over the new volumes. The Music Room was extended to create the new office and receive the roof. 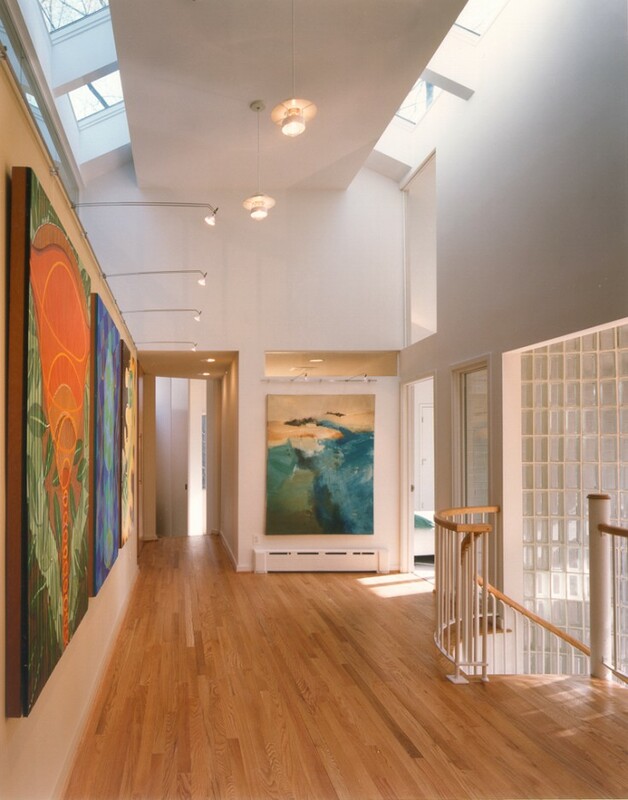 A new interior gallery is the core of the plan and provides ample display space for the owners’ extensive art collection. The new bedrooms are arranged around the gallery and an exterior courtyard that allows light and air into the interior. A glass block enclosed spiral stair bridges the volumes and connects the main floor with the basement. 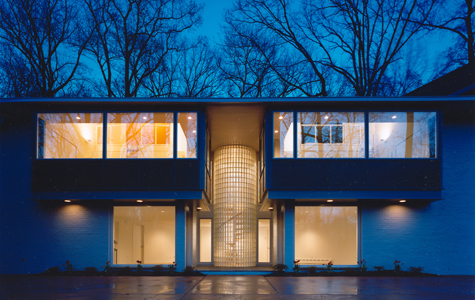 In 2002, the Glass Bridge received a Renaissance Award from Remodeling Magazine; and in 2003, it received a Renovation Award from Residential Architect. Glass Bridge at Dusk with Exterior Courtyard.